Yeah, but: It's the first day. The Long Version: Scramble intersections aren't new; they started in Vancouver and Kansas City back in the 40's. 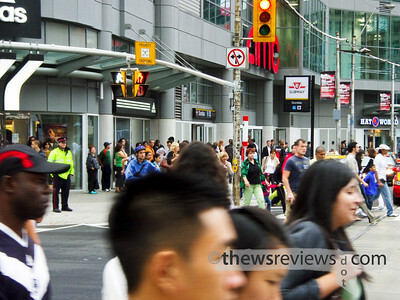 The idea has finally come to Toronto at our intersection of Yonge and Dundas, the extremely busy epicenter of advertising. It's planned for three more intersections in the downtown core, and I'm looking forward to seeing it. I've seen these elsewhere in the world, and they're as effective as they are entertaining. The sequence is: north-south, east-west, all-way scramble, and repeat. (I remember the sequence as "NES", which some may associate with a primitive home computer.) 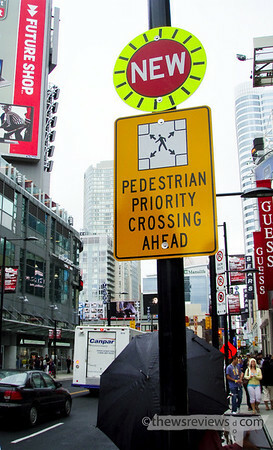 A normal pedestrian scramble crossing would not permit pedestrians to cross any time except for the scramble period, but since no turns of any kind are allowed for vehicles, there's no reason to keep people off the road during the traffic phases. But the designers didn't quite think all of the implications through. There are now amusing and irrelevant 'don't walk' phases when the pedestrian signal is about to turn back to 'walk' in a few more seconds. The good news is that pretty much everyone ignores the walk signals at this intersection anyway. This is a pair of firsts for me: the first video I've ever posted on-line, and my first time crossing diagonaly across an intersection in Toronto. Legally. It was entertaining.